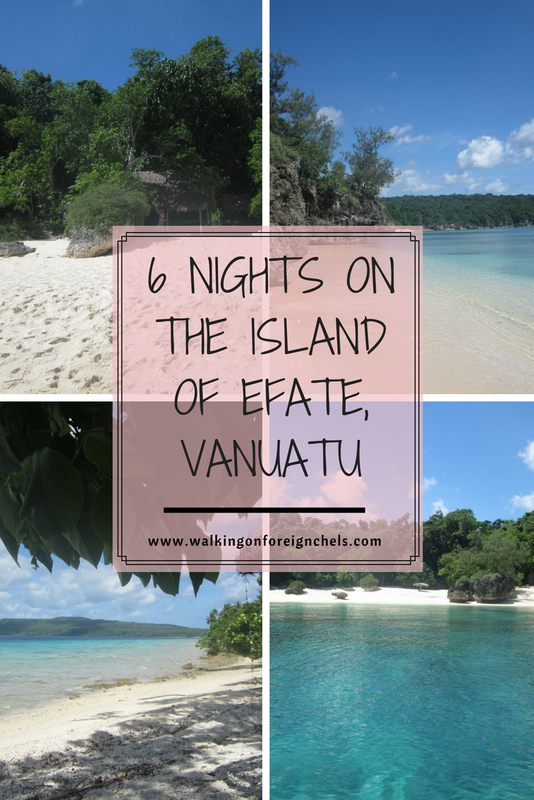 Recently we spent 6 nights on the island of Efate in Vanuatu. It’s the main island in the group, we would have liked to have visited a few of the other islands, we just didn’t have the time or the money to do so. 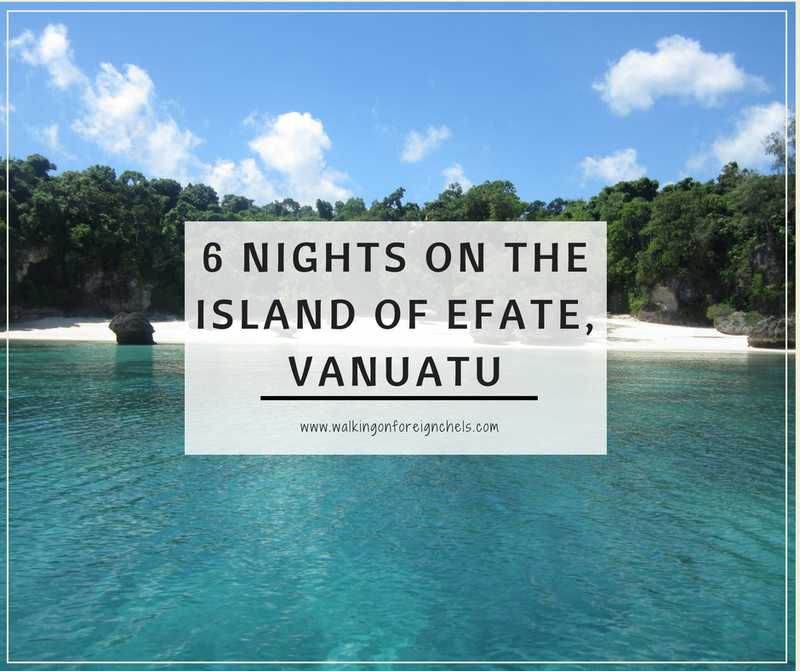 But, if you’re planning on going to Vanuatu definitely look into getting out to the other islands like: Tanna (for the volcano), Espirito Santo and Epi (there’s a friendly dugong there!). There is only one airline that flies between the islands, so it does cost more. But this is quite a common thing in the islands. This was an interesting trip for me as a week before we flew out, I managed to break my ankle while working out at the gym! So I was in a moon boot for 6 weeks. But my doctor’s were sympathetic and gave me a lace up boot brace thing to use so I didn’t have to take my moon boot everywhere. Efate was great! 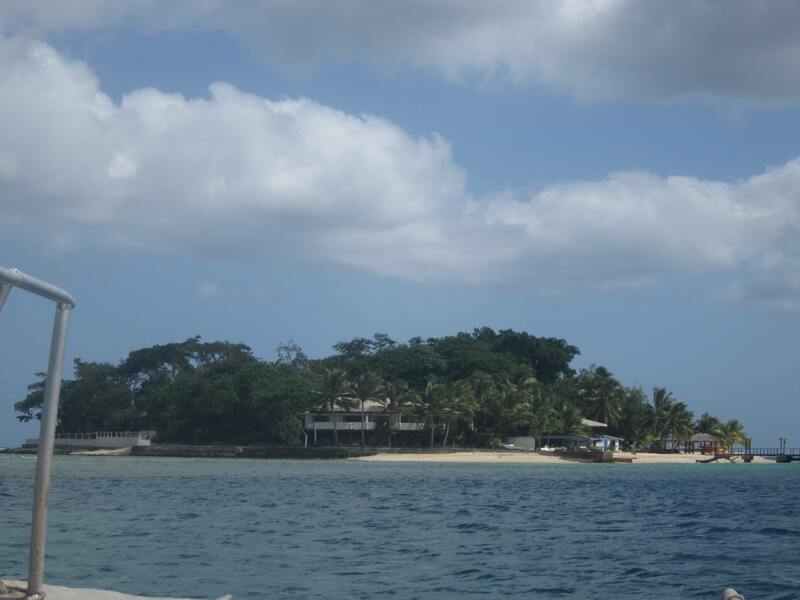 We had a lot of fun exploring Port Vila and snorkeling at different spots around the island. Efate is quite large in comparison to the other islands I’ve been to like Rarotonga and Tonga. 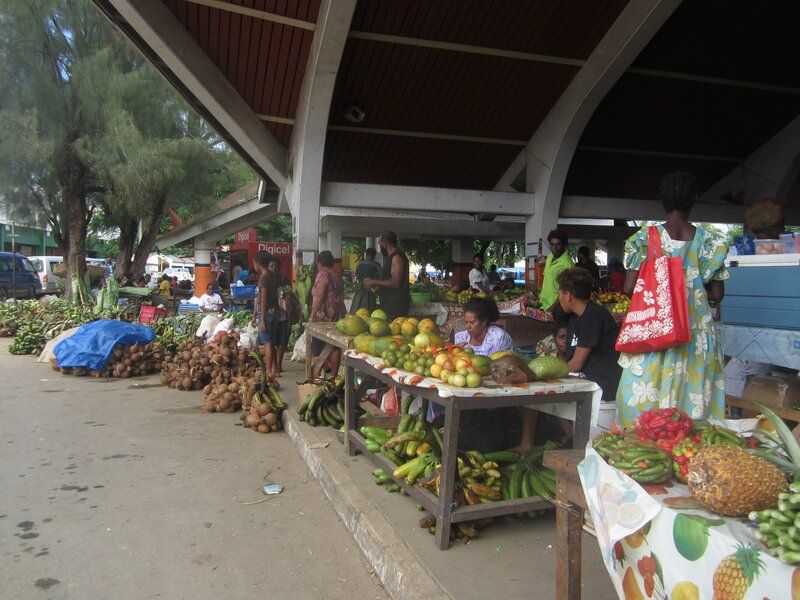 Port Vila is the capital of Vanuatu and is located on Efate and is really the only town on the island. There are a couple of other little communities around the island but they’re only made up of a few homes. No shops or restaurants or anything. This shocked us a little as the island is fairly big so we had expected to see at least one other small town as we circumnavigated the island! 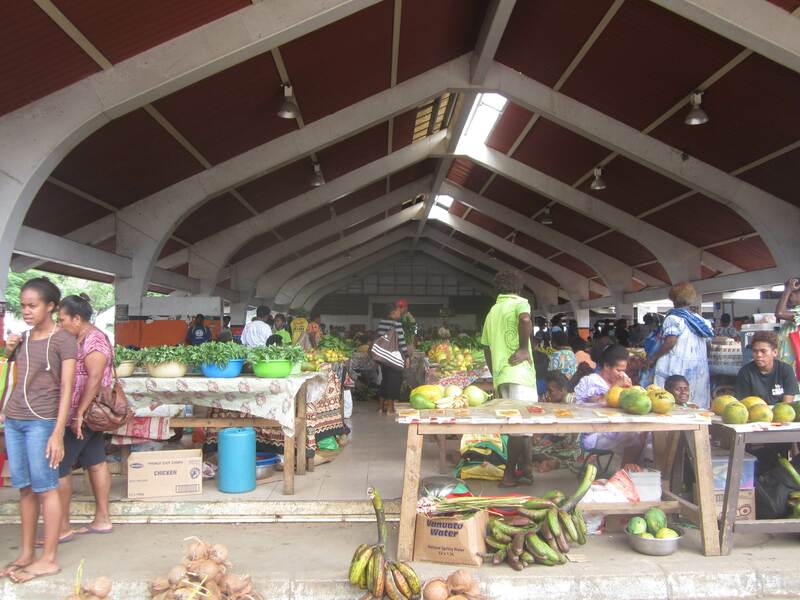 It’s not a large town, but it is where all the action is and most of the hotels and resorts are located in and around Port Vila. It is also a popular stop for cruise ships so often the town is really busy with cruise visitors. They usually spend the day docked in Efate. I think we saw about 4 different ships in the 6 days we were there! 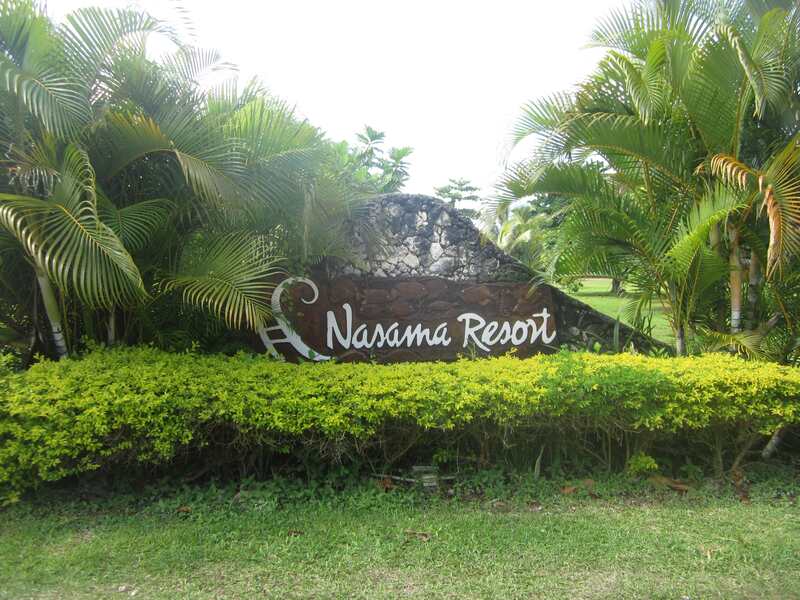 We stayed at the Nasama Resort, which was amazing! Not the cheapest place to stay, but it is a really nice place. The rooms are all well-presented, the grounds are beautiful and well looked after. There is an infinity pool wrapped around a gazebo type thing with deck chairs and the ocean is right there! 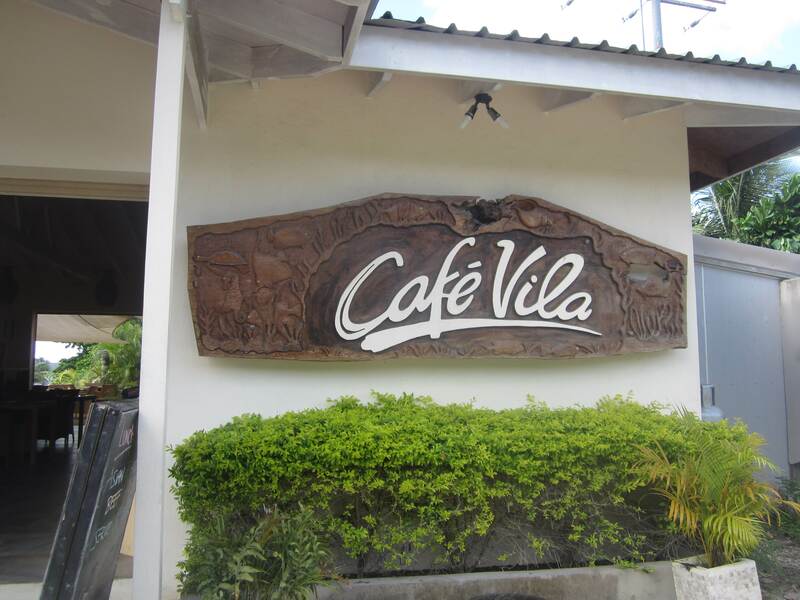 Nasama Resort also has a restaurant on-site called Cafe Vila and the food there is unbelievable! Even if you don’t stay at the resort, you should definitely check out the restaurant. We actually went out to Hideaway and Erakor to go snorkeling. They’re both places you can go out to as a day visitor, there is a charge but it’s a good way of seeing some of the islands dotted around the coast. 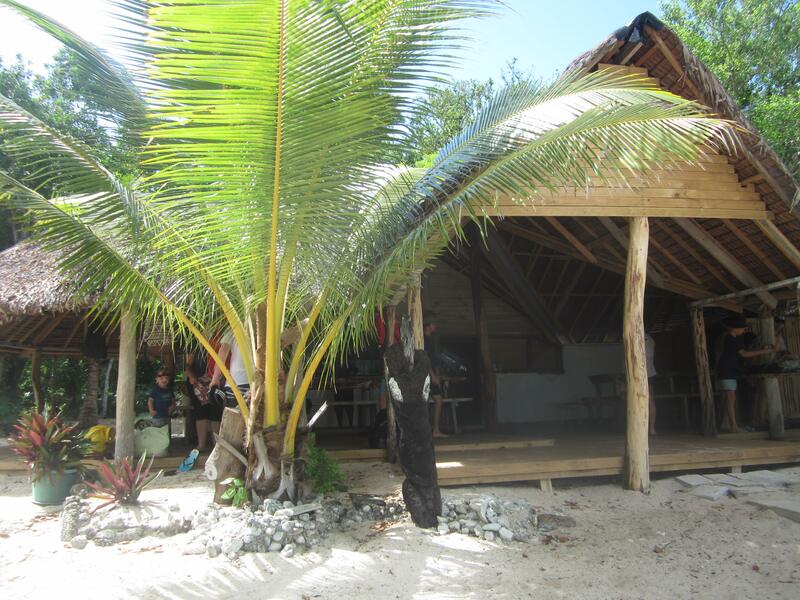 If you’re not planning on going out to any of the other islands in the chain, there are still things to do in Efate. Most things to do are relatively close to Port Vila but you will still need some form of transport to get around (more about that later). As I’ve previously mentioned, we went for a drive around Efate, It took us approximately 3hrs to make it the whole way around with only one stop along the way for a drink. There are a couple of different places to stop and check out though like Blue Lagoon, which is a swimming hole right on the beach and is frequented by locals and tourists alike. There are a number of little islands offshore of the main land. Not all of them are particularly easy to get to however. Hideaway Island: Hideaway is a resort island that accepts day visitors for $1250VT per person. There is a free ferry that travels back and forth between the island and the mainland 24/7 so you won’t have any issues spending several hours out there at your own leisure. We went out for an afternoon and spent a few hours snorkeling right off shore. Their are some beautiful coral gardens and lots of colourful tropical fish to see. We spotted a few different species that we hadn’t seen before like the titan trigger fish, cuttlefish, and a black and white spotted snapper. There is even an underwater post office there if you decide you want to send a postcard. They can be purchased in the main entrance gift shop, where you pay to access the island. 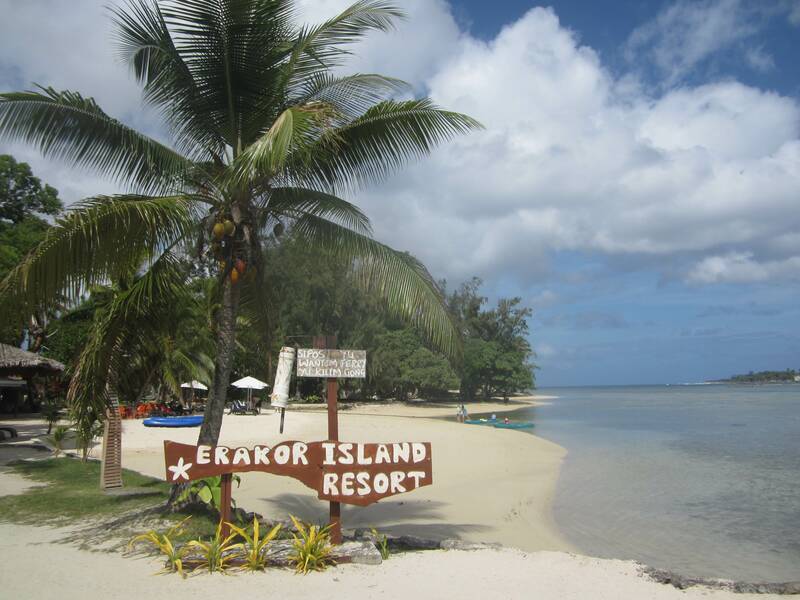 Erakor Island: This is another resort island that is accessible from the mainland by ferry, though I’m not sure what time they run as we kayaked over from our resort which was located just across the water, about 10 mins by kayak. We walked around the whole island, which took about 10-15 mins. It’s not huge and we spent some time snorkeling along the ocean-facing side of the island. We were looking for seahorses as we’d heard they can be seen there but unfortunately, we didn’t spot any. There is a little bit of history on Erakor Island. The first Christian mission was established here and the remains of the church and mission house can still be seen in the middle of the island. 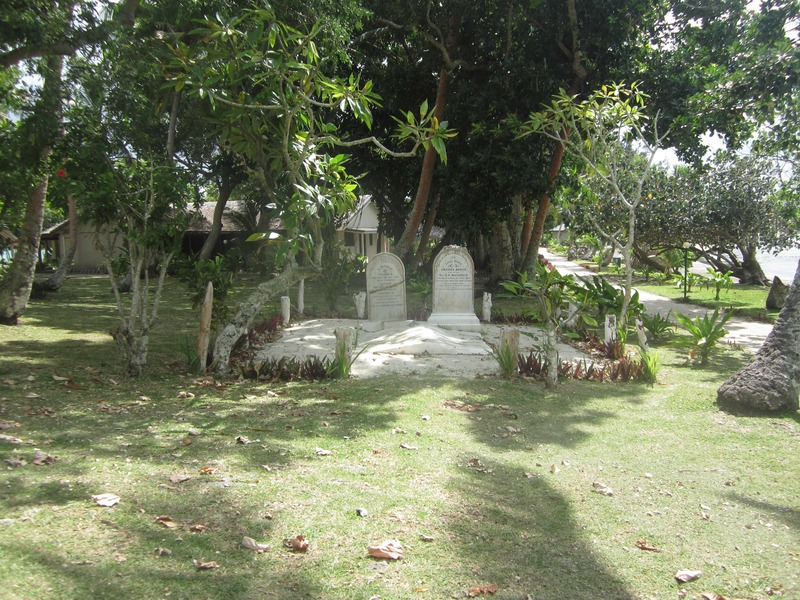 There are a few grave sites here as well, so make sure you take a minute to check it all out. Some of the bungalows on the island looked pretty flash though, we pulled our kayaks up outside one that had it’s own private infinity pool off the deck, looking out over the water and a big day bed thing to relax on in the sun. Moso (Tranquility) Island: This is one that is a lot harder to get to, I’m pretty sure there is a resort out there but it’s a private, exclusive type one and the only way to get out to the island is either by staying there, your own transport or a tour. We opted for a snorkeling tour on board the Coongoola sailboat, but it was docked for maintenance at the time so we went on a different boat which was fine. 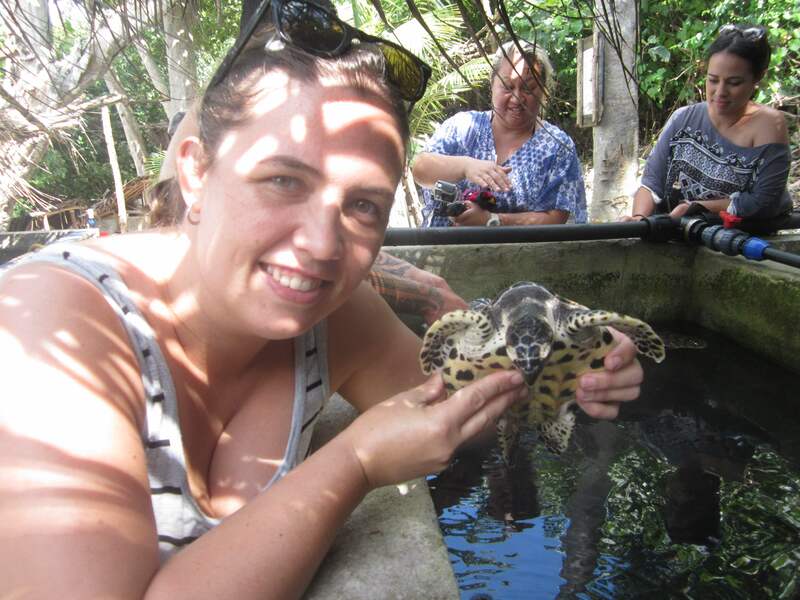 They took us to Moso Island to see the Hawksbill turtle hatchery, where we got to see baby turtles up the age of 18 months. They are then released into the wild after being tagged so they can be monitored over the coming years. 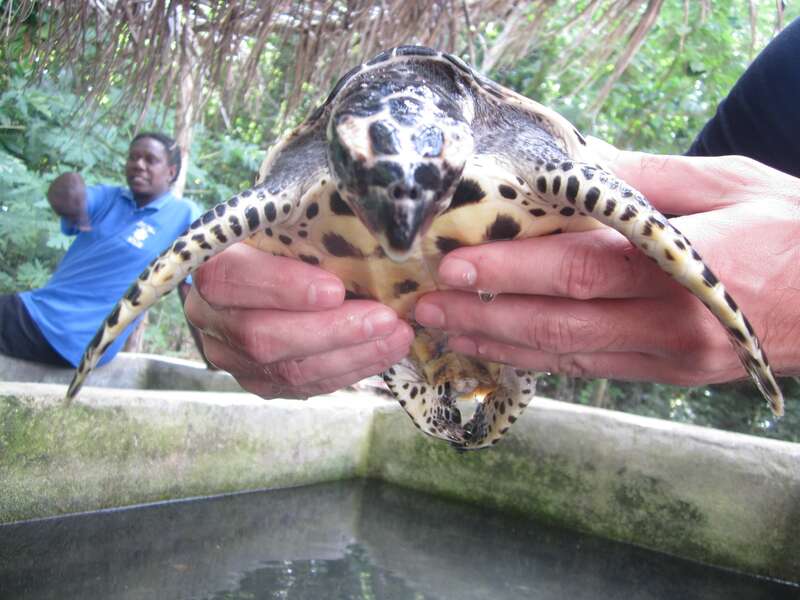 Hawksbill turtles (along with a lot of other sea turtles) are endangered now and if we don’t do something soon, it is predicted we won’t have any left in the next 30-50 years. 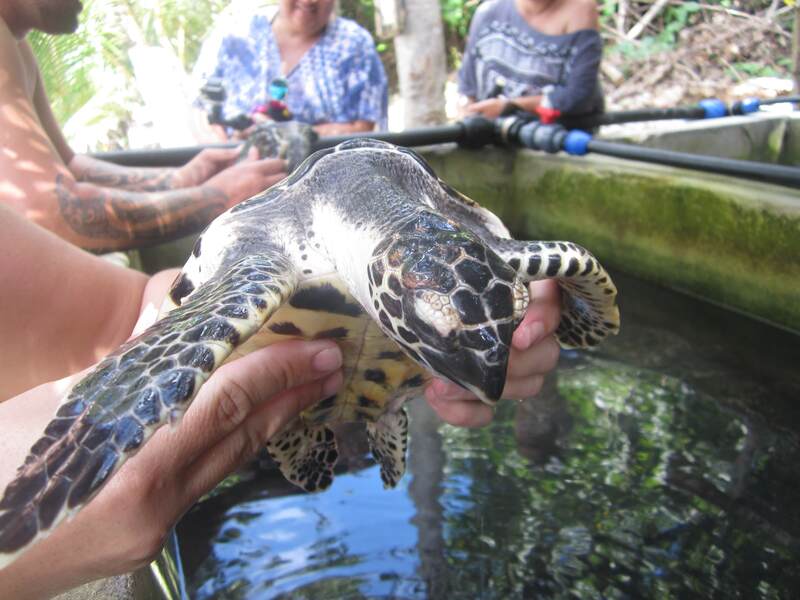 We were able to take photos with the turtles and pick up the bigger ones that were due to be released soon. You’re not allowed to touch the baby ones. It was a great experience to see them up close and after getting back on the boat we spotted a couple of adult ones in the water. The tour then goes around to the back of Moso Island to a private beach where we had lunch and were taken out onto the reef to snorkel out there. We were told that often Manta Rays can be seen over the sandy bottom but we weren’t lucky enough to see them here (we have seen them in Ningaloo before though). We did spot a large Eagle Ray gliding through the water, so that was pretty amazing. 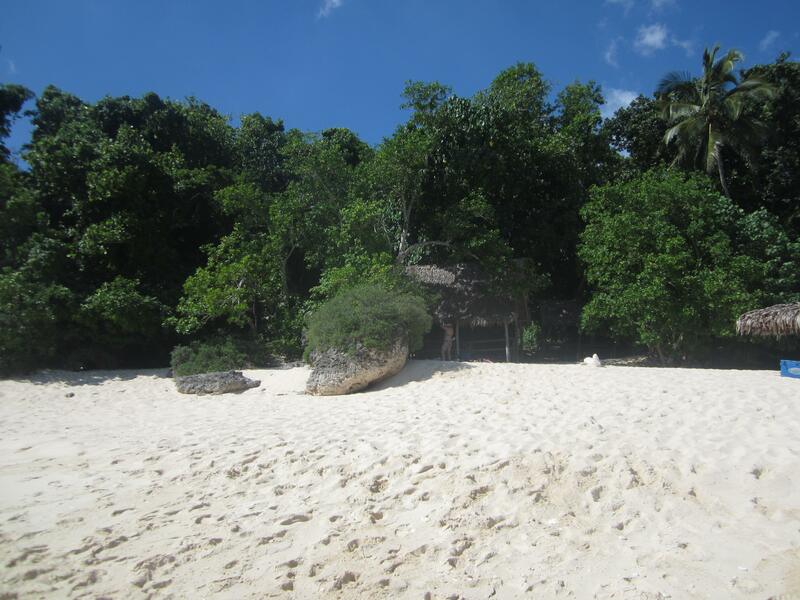 Lelepa Island: Another island you have to do on a tour. This one does have some snorkeling but you also learn about the island itself as it is guided by someone from the Lelepa Island village. We were taken on a walk through the bush where we were told about the different plants used in traditional medicine, which is still used today by many of the island’s inhabitants. We also learnt about the cannibalistic history of the island, though this hasn’t been practiced since the late 1960’s here. There are still islands within the Vanuatu chain that do still practice cannibalism though, but I’m pretty sure these are few and far between and are on pretty remote islands. After the walk through the bush we were taken to a beach for lunch and a snorkel from the beach. It was a nice snorkel spot here and we saw something strange in the water, it was a red jellyfish with a fish caught in it’s tentacles. We couldn’t work out if the fish was trying to eat the jellyfish or the jellyfish trying to eat the fish, probably the latter! Before we got back on the boats we were taken inside a large cave that goes back about 60m and is used for shelter and different rituals. We then went on to another snorkel spot which was a lot deeper, but the water was so clear! It was really amazing, I’ve never swum in waters so clear. We were even able to spot an octopus hiding in the rocks out at the second snorkel spot which was pretty cool as we haven’t seen too many of them in the wild. This was a really cool experience. We couldn’t decide if we should do it or not but in the end we went for it and I’m so glad we did, it was amazing. 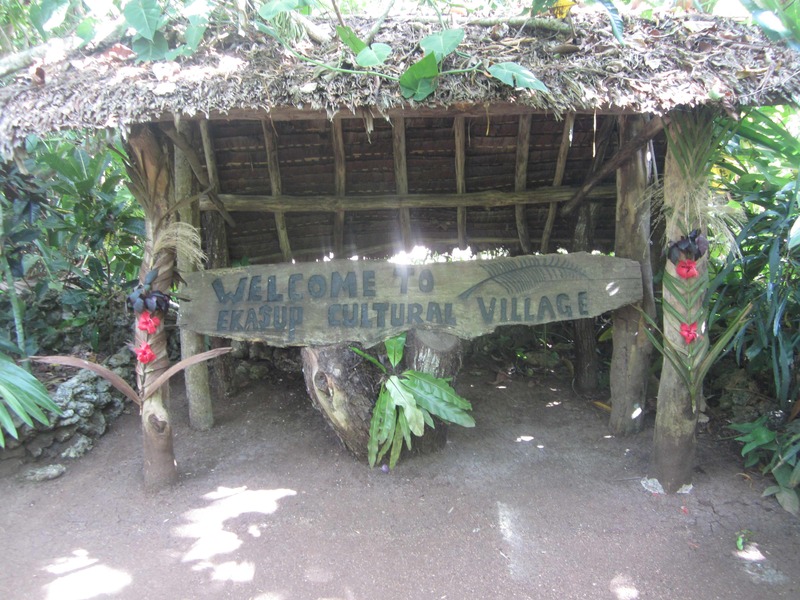 The village is located just outside Port Vila, about a 10 min drive down roads with no signposts so you kind of have to guess a little bit unless you have a GPS, but if you get lost, like we did! Just ask the locals, they’re super friendly and happy to help. It’s completely independent from town and is self-sufficient. So all the inhabitants in the village are from one tribe who’s numbers used to be quite large but today are a bit smaller. 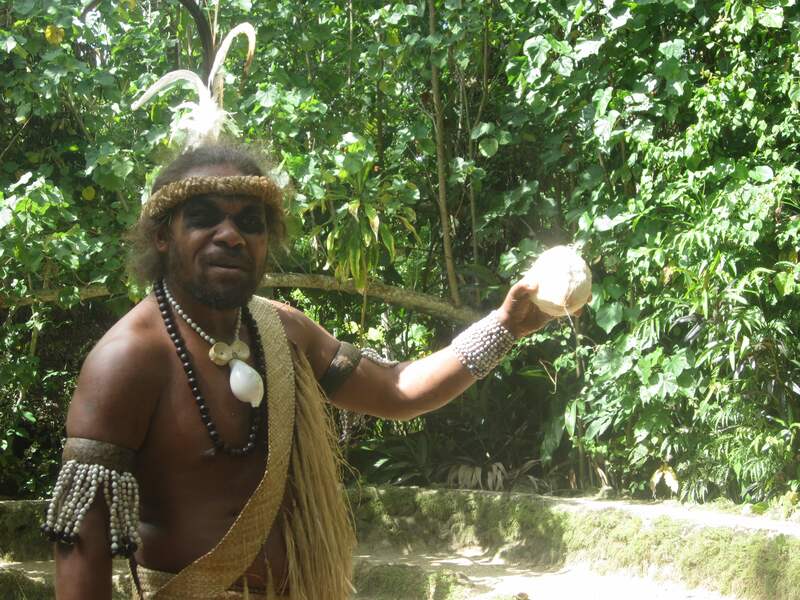 We learnt that there is also another tribe located in the mountains in the interior of the island and the two tribes interact with one another. You’re welcomed into the village by the men and one of them then led us around the village, showing us different parts of their everyday lives and the tools they use as well. It was really interesting to learn about it all from someone who still lives this way. In one area, we learnt about births, deaths and marriages in the different tribes, and there is one tribe on one of the remoter islands that knock out the woman’s front teeth once she is married to show she belongs to someone! Thankfully this is not something all tribes do but it common to mark a woman somehow to show she is now married, this can include tattooing as well, which is less painful and more attractive! The tour ends in a little market area where you can buy a few locally made trinkets and then we were ushered into an amphitheater type area for traditional music and dance. All money spent at the village, including the price of the tour is kept for the village. None of it goes to the government which I thought was pretty cool as it allows the village to prosper. It is only a small museum but worth checking out. We wanted to get the guided tour but the guide was away that particular day so we were unable to. I’m pretty sure we paid $1000VT per person to go in. It is laid out quite well, but the cases and the relevant documentation are a little dated though this doesn’t take away from the information you will gain from checking the place out. 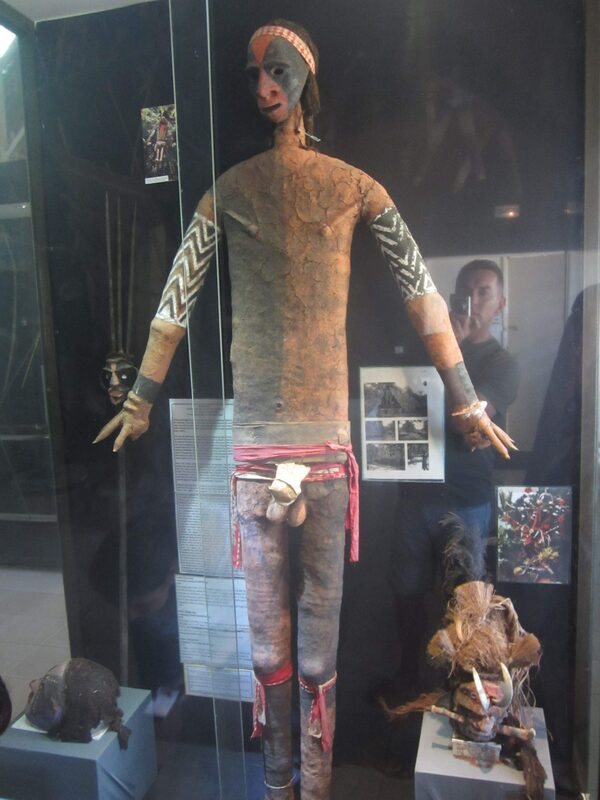 There is a lot about other tribes on the different islands as well as a large area dedicated to the excavation of Chief Roimata, which is really interesting. There were two layers to the grave as many people and animals were buried with them. Legend has it all went willingly but the archaeological evidence suggests this was not entirely the case. Many of the skeletons belonged to people who probably took poison but there is at least one female skeleton that was buried alive. The markets are in the middle of town and are pretty hard to miss. They operate everyday except Sunday I believe and it’s where the locals go to get their produce. 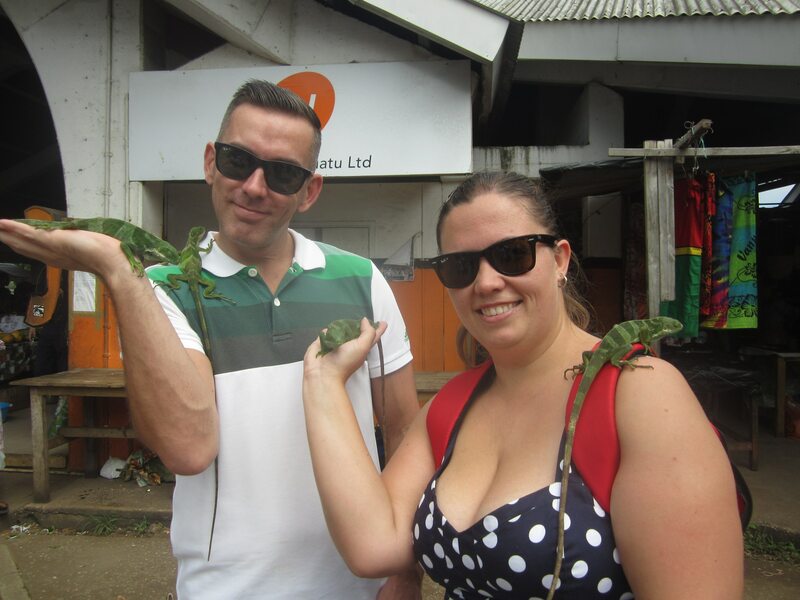 There was a guy there that had these iguanas you can hold for a photo, for a price of course but it wasn’t much so we were happy with it. I think it cost us about $100VT each which is a couple of dollars so nothing too extreme. And I love iguanas! I wanted to take them home with me. There isn’t really too much there worth buying unless you’re after fresh fruit, vege and meat/fish. The rest of it is generic souvenir trinkets and not really what we were after. We struggled to find cool souvenirs that we wanted to buy and ended up buying something at the craft market and at the museum in the tiny gift shop there. There is also a big market area on the docks where the cruise ships come in to catch the cruise passengers but if you’re staying on the island you can’t get in there to check them out, so I really have no idea what they’re like. Anything else we should check out?? Mele Cascades – we decided against this as it is now owned by Asians and the cost for what it is, is quite high. If we had been putting money back into the local economy we would have had no issues paying to go. Blue Lagoon – this is on the opposite side of the island from Port Vila. Eton Beach – a bit further around from the blue lagoon. We didn’t stop there as you had to pay to go on the beach but I’m told it’s quite a popular place to hang out, swim and surf. Port Havannah – we did go here but only to get on the boats for the tours we did. This is where the American soldiers were stationed during WWII and there is still a lot of their debris around including planes and jeeps in the water. There is somewhere you can go for a local to take you out to a submerged WWII plane at low tide but we couldn’t find it – no signposts! We hired a car, which was not the cheapest option but definitely the easiest option. There are a few different hire companies on the island, and we went with World Car Rentals and they were really good. Almost everyone is a bus driver! There are vans everywhere and if they have a B on the license plate (most of them do) then they can take passengers. I’m pretty sure you can just flag them down and they’ll take you where you need to go. There isn’t really any taxi’s and no actual bus route. The vans are a cross between buses and taxi’s really. 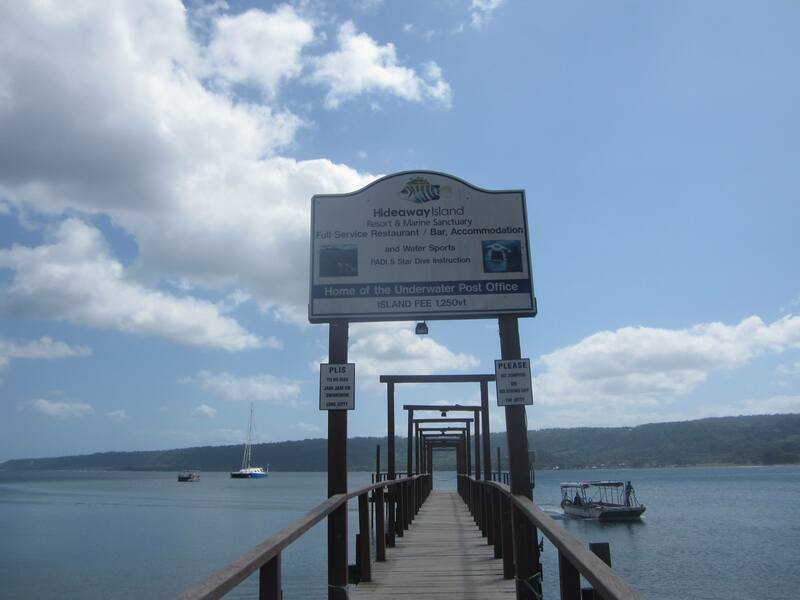 If you’re close to town you can walk around Port Vila, it’s fairly compact but if you want to go further around Efate you will need to find another way of getting around. Random stuff you might want to know! The currency on the island is Vatu mostly but they often display their prices in Australia dollars as well (they’re not far from the North-Eastern tip of Australia). We had read that things on the island were quite expensive before we went. But when we got there we found that the prices were pretty similar to what we pay in New Zealand so it didn’t make too much difference to us. They drive on the right, something we didn’t know until we got the hire car at the airport! I (wrongly) assumed that they would be like Australia and New Zealand and drive on the left. The roads in Port Vila are SHOCKING!! Full of pot holes and bumpy. But as soon as you get a little way out of town, and start driving around Efate, the roads are fine. It was an awesome holiday but I do wish we had more time and more money to be able to explore some of the other islands. I’d like to think we’ll go back there one day and explore Tanna, Epi, Espirito Santo and others, but I think the likelihood of that happening is slim. So if you go there – go out to the other islands and make the most of your trip! I have never been to this place and have never heard about it too. 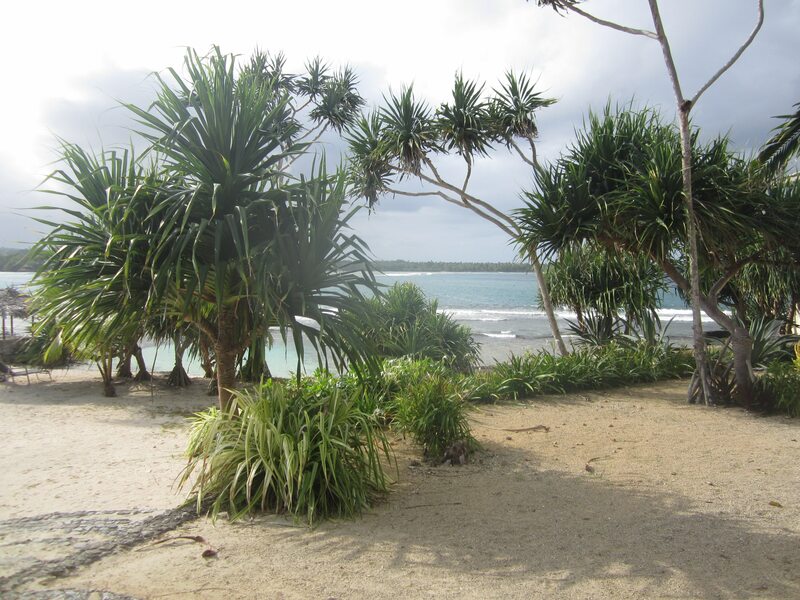 I’ve always wanted to visit Vanuatu and you have shown me why I should definitely go! 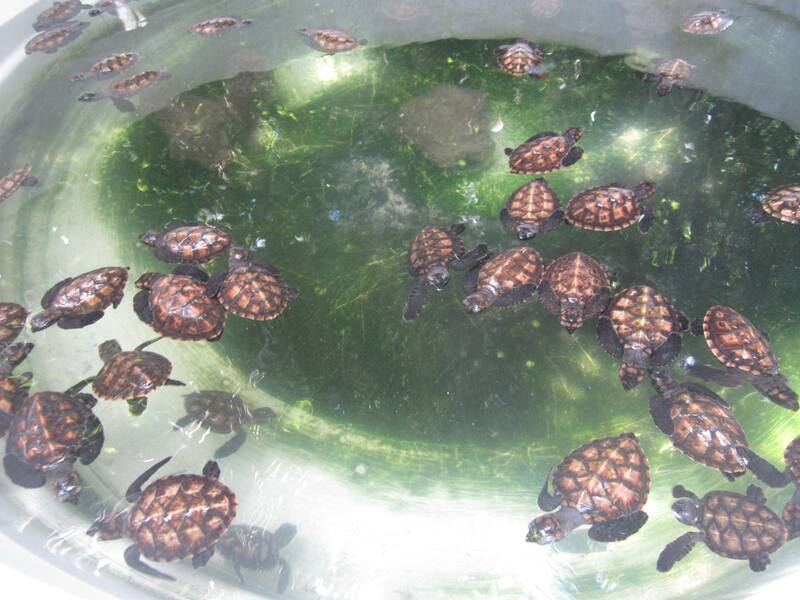 Those beaches look beautiful and the turtle hatchery and the cultural village look like amazing experiences. Great blog. Looks like a fun spot I’d love to see the sea turtles and see them released that would be awesome. Ever since I learned that there is an underwater mailbox in Vanuatu, I’ve wanted to go and visit. Great post, gal! This is really insightful, love the turtle photos – so cute. Sad to hear that they are so endangered though. Thanks! Very sad that in a few years, these islands would be inundated by rising sea levels. Vanuatu is already feeling the effects and other atoll islands are too. Still…this uis the first post I’ve read about travels in this part of the world! I’ve watched enough BBC travel documentaries about them to know what to expect but wow! I’m glad you chose not to visit the Asian run attraction. Better to put money back into the local economy and people. Lizards on me?? *shudders* No ma’am! I love reading about places that aren’t mostly visited by tourists relatively. To be honest, ive only heard about vanuatu the first time during the survivor games and i loved the rawness of the beaches there. I love how they are preserving the environment and their culture. Sounds like a really fun trip for you guys. First time I heard of Vanuatu is from the reality game show, Survivor: Vanuatu. 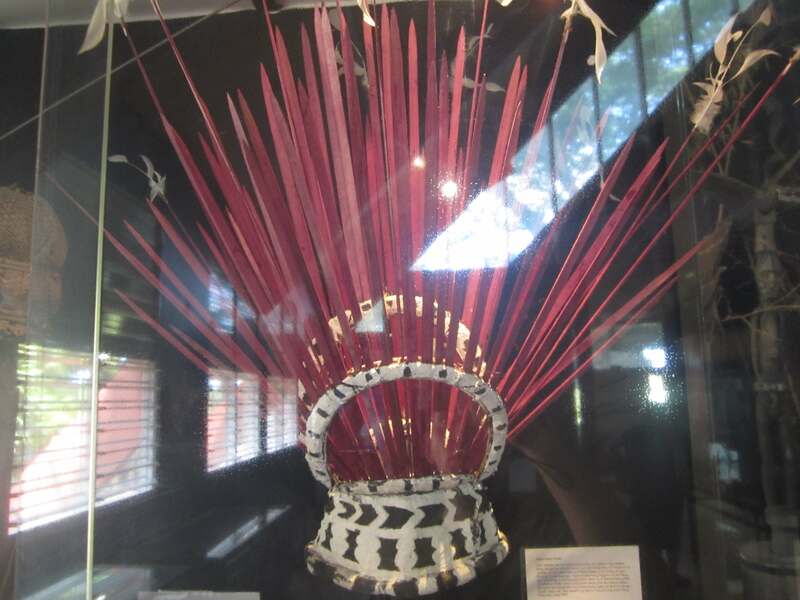 After reading your post I realise that Vanuatu certainly has lots more interesting things to see and do. Great job in writing this informative post! If it wasn’t so far, I would go right away. It looks just too wonderful. But is it safe to touch the turtles – worrying for their well-being, not for you 😉 ? 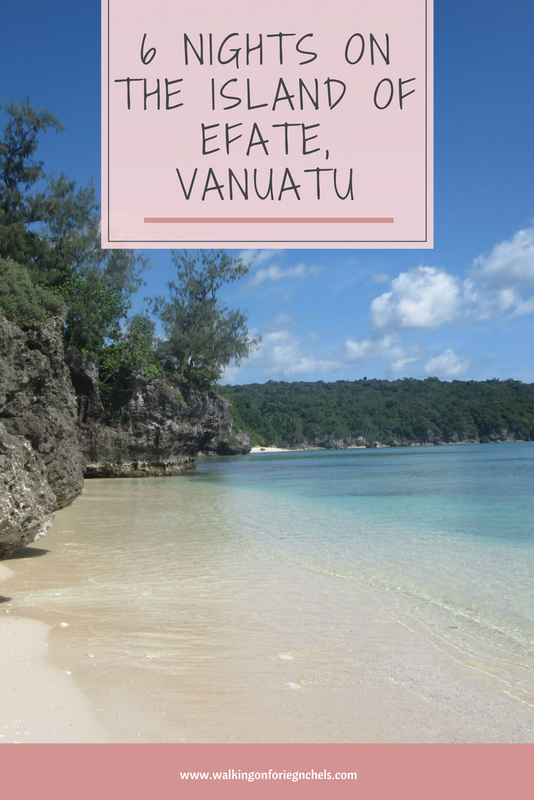 Efate looks amazing, so much to see and do! I also like that it is immersed in culture and showcases the island’s wildlife/marine life! Thats a great insight you gave me. Would like to visit for sure! 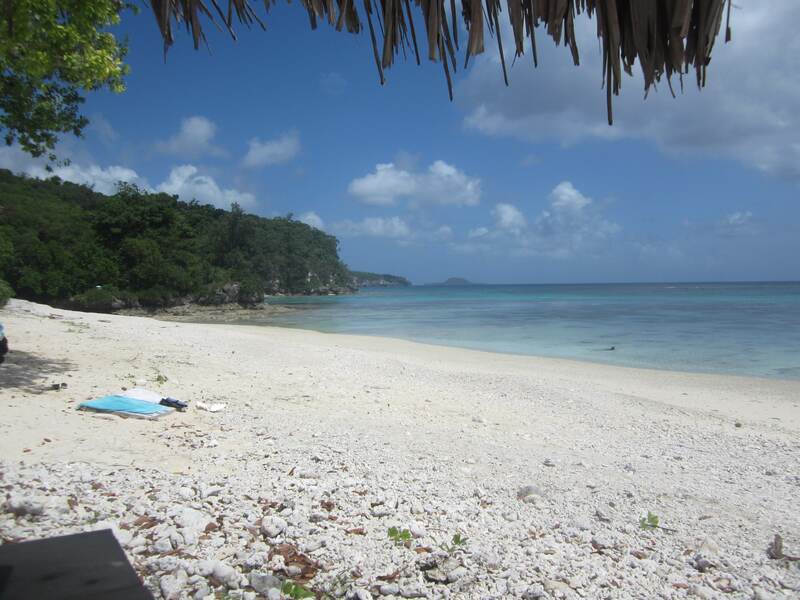 This looks like such a chill time on Vanuatu. What is embarrassing is I had to google where Vanuatu is!! How lovely!! 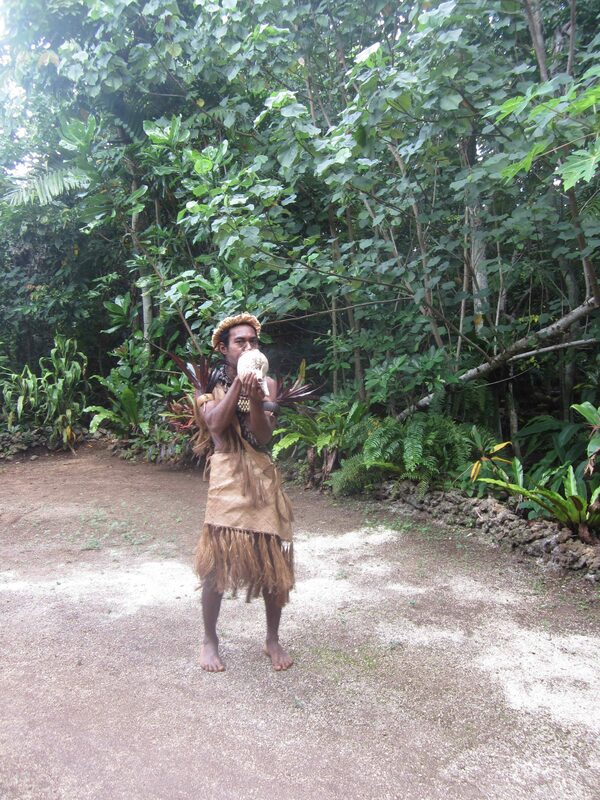 Vanuatu looks like such an interesting place! Reminds me a little of Fiji. 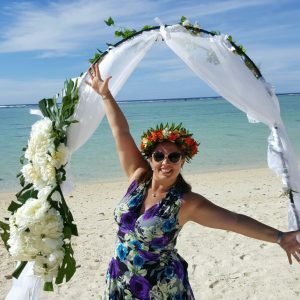 How did you get to Vanuatu? Is it expensive to fly there? We live in New Zealand so flew from Auckland via New Caledonia. It’s not too expensive to get there, about $1000(NZD) return per person. I have heard so much about these islands that it’s high time I pack my bags to check them out. I so agree with you when you say that one must have time and money in hand to enjoy them to the fullest and best possible. I too believe we should try and explore the place as much as we can in one chance because we might not get another chance in life. I love the mailbox idea under the sea. I hope to see it someday. amazing. You guys had a great adventure. Love the picture with all the animals climbing on you 2. I didn’t know about this place but sounds very interesting, I’ll look into it.